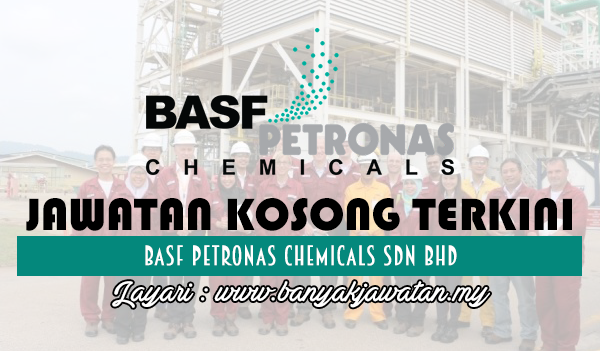 BASF PETRONAS Chemicals Sdn Bhd is a Malaysian-based joint venture between BASF SE and Petroliam Nasional Berhad (PETRONAS), Malaysia’s National Oil Company, under its subsidiary PETRONAS Chemicals Group (PCG). Incorporated in 1997, the company operates an integrated petrochemical complex situated at the Gebeng Industrial Zone, Pahang. The company’s share of capital is 60% held by BASF SE and 40% by PCG with a total investment of about RM3.4 billion (US$900 million) in production facilities for Acrylic Monomers, Oxo Products and Butanediol. The range of chemicals produced by BASF PETRONAS Chemicals meet the growing demand in various industries including plastics, adhesives, lacquers, dyestuff, automobile and industrial coatings, paper, diapers, water treatment, textile and leather. 0 Response to "Jawatan Kosong di BASF PETRONAS Chemicals Sdn Bhd - 13 September 2017"